Dear readers of Monsoon Spice, I wish you all a wonderful, sparkling and joyous Deepavali. May you all attain full inner illumination and let this festival of lights burn all your bad times and enter you in good times! A festival brings family together and hearts closer. A festival brings happy times and sharing times. A festival brings smiles on a face and laughter and joy. And I sure have some delicious food to indulge during festival of lights. 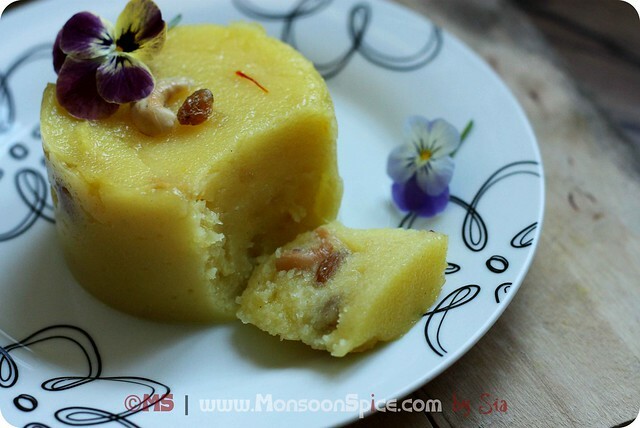 Something sweet, something simple, something quick to make and something delicious and this something is Pineapple Kesari Bhath or Pineapple Suji ka Halwa. Although I love to cook and can happily spend my whole life in my kitchen stirring the pots, chopping the vegetables and pounding the spices, I didn’t want to be the slave chained to my gas burner. So I chose to cook some simple homemade foods for this Deepavali that my loved ones enjoy. With little preparation and careful planning, it was a breeze to come up with mouth watering delicacies to please everyone’s palette and soul. 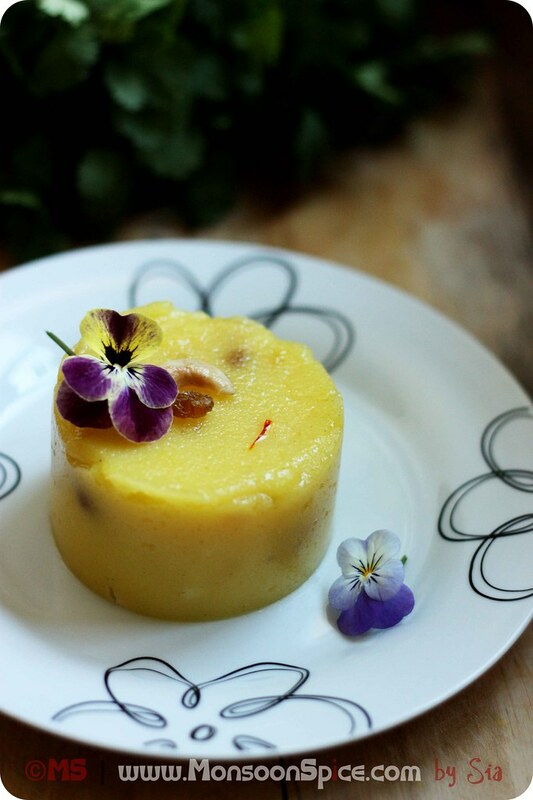 The sweet dish I chose to make is this divine Pineapple Kesari Bhath or Semolina Pudding loaded with Ghee, laced with juicy pineapple bits and flavoured with the most expensive spice in this world, Kesari/Kesar/Saffron. After all my family deserve the very best! 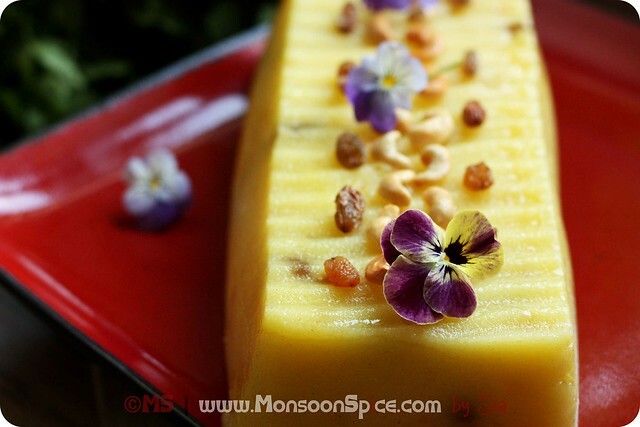 This recipe comes straight from my lovely Amma who makes the best Pineapple Kesari Bhath. My mother usually chops the pineapple very finely instead of pureeing them so that each spoonful delights and surprises you with wonderful tiny, juicy pieces of pineapple. 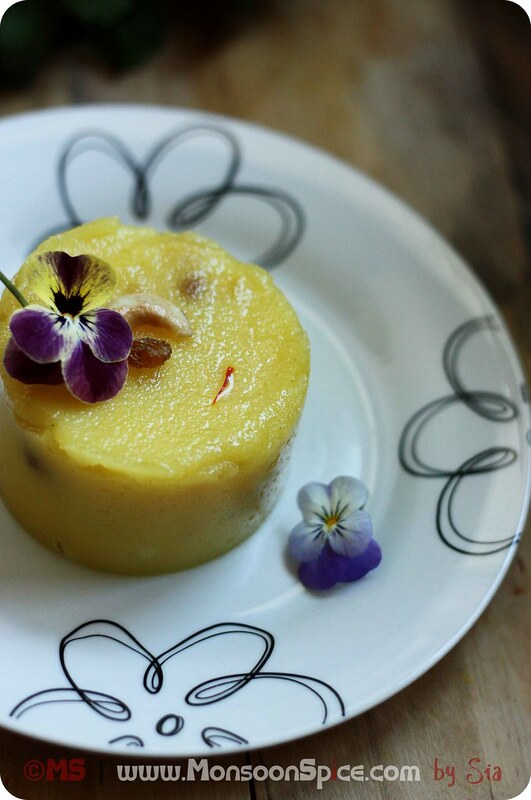 And the heady aroma of saffron and the special taste of Ghee just add that special touch to this humble pudding. 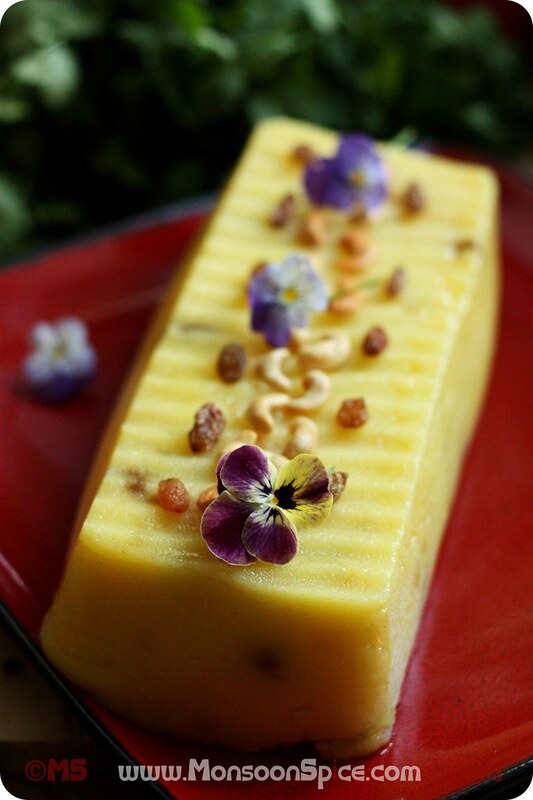 Crunch from roasted cashews and juicy bits of raisins or sultanas makes this Pineapple Kesari Bhath a divine blessing or Prasad. 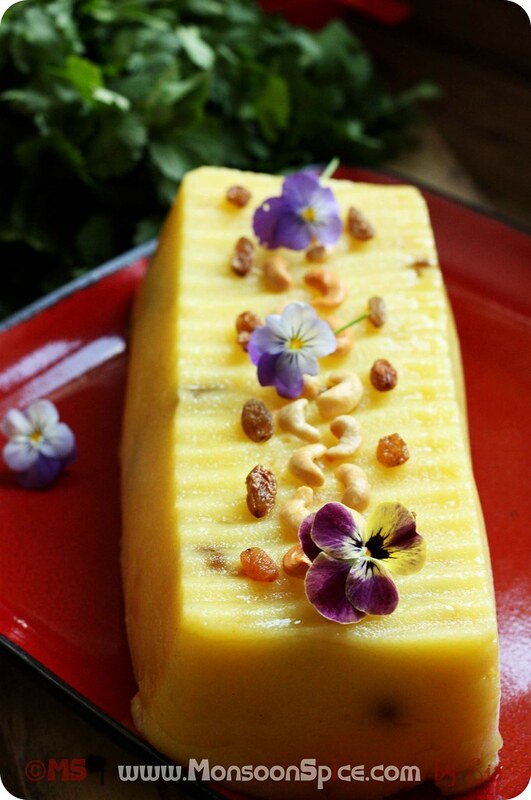 Traditionally served for breakfast in my native with spicy Upma/Uppittu and Kara Avalakki, this Pineapple Kesari Bhath is a crowd pleaser and easily jazzes up any boring meal. Boil 4 cups of water and keep it aside. It helps in speeding up the whole cooking process. 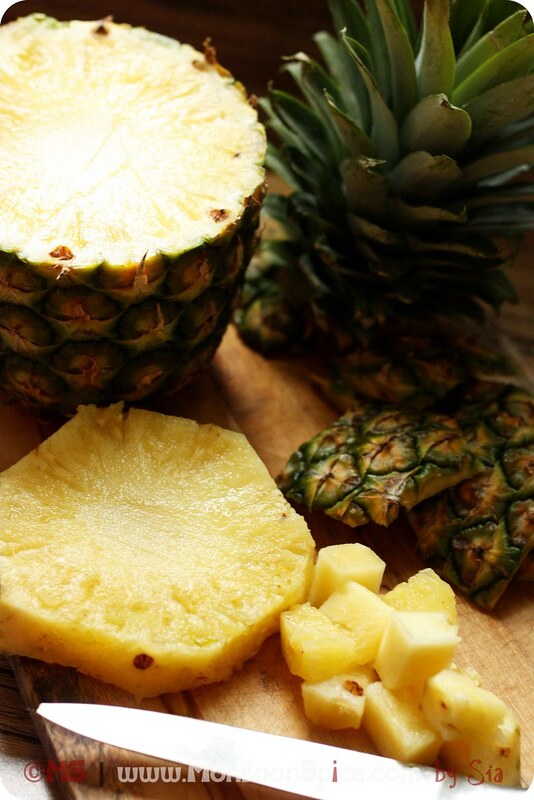 Dissolve 1 cup of sugar in ½ cup of water and add finely chopped pineapple pieces to it. Cook them on medium flame till pineapple pieces are cooked through, about 5 minutes. 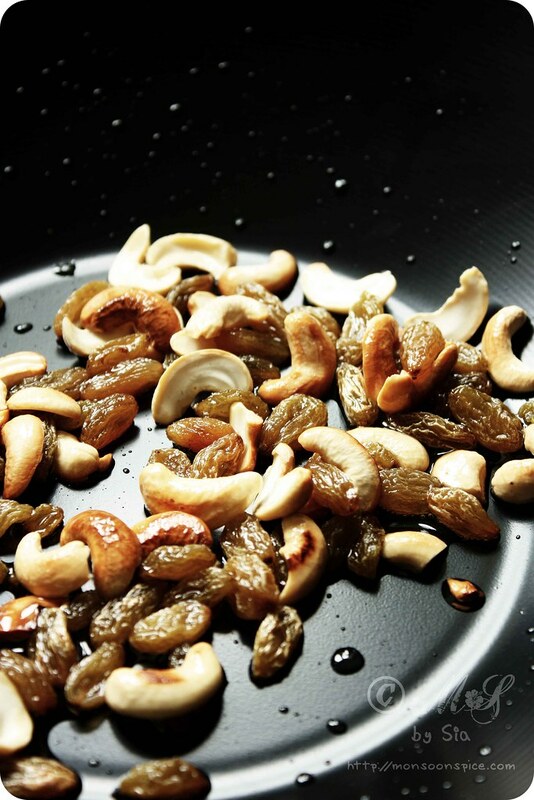 Mean while, heat 2 tbsp of ghee in a heavy bottomed pan and add broken cashews to it. Just when it turns light golden in colour, add the raisins or sultanas and fry them till they are golden and plump. Using slotted spoon remove them from pan and keep aside for later. In a same ghee, add semolina or rava and roast them on low flame till they are fragrant and turn light golden. Care should be taken not to brown them. It takes around 3-4 minutes. 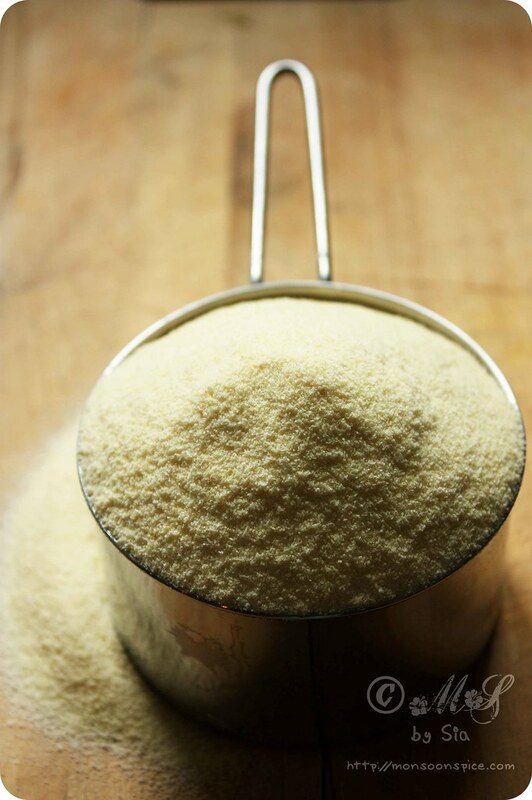 Once the semolina is roasted, add around 4 cups of boiling water and let the semolina cook undisturbed for around 3 minutes on medium flame. Next mix the semolina so as no lumps are formed. Now add the remaining sugar, cooked pineapple along with the sugar syrup in which it’s cooked. Keep stirring the whole mixture for 3-4 minutes. Slowly start adding the ghee, one tbsp at time, and keep stirring the mixture. Once you have used up all the ghee, keep stirring the mixture till each grain is cooked well and the ghee starts to separate to the side of the vessel. Add roasted cashews and raisins, and saffron soaked in warm milk and mix them all well. 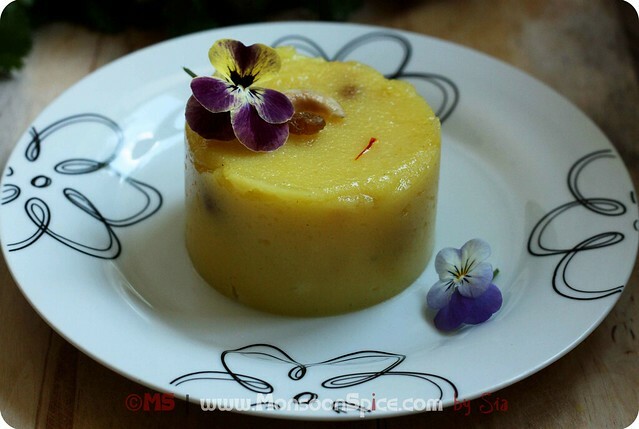 Immediately transfer the Pineapple Kesari Bhath to greased plate or cake tin and spread it well with back of a ladle. Let it rest for 5-10 minutes and cut them into desired shapes. Serve them hot, warm, chilled or at room temperature and enjoy this delicious Pineapple Kesari Bhath or Pineapple Suji ka Halwa. 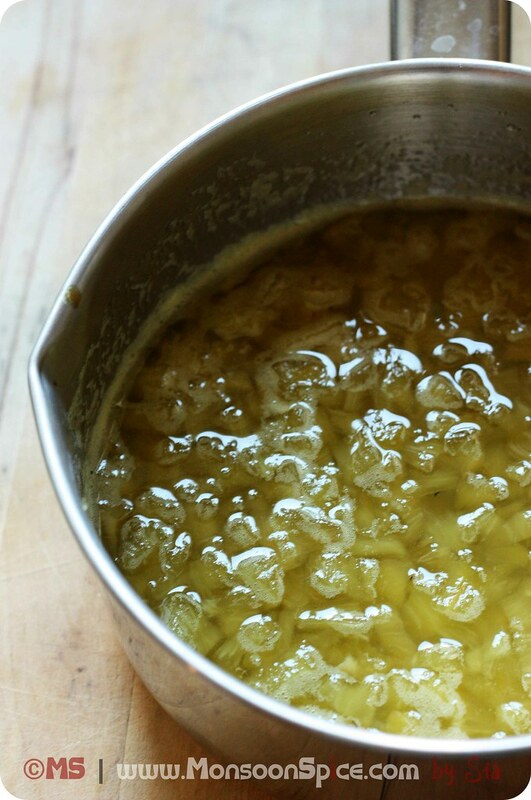 You can also puree the pineapple pieces and use this puree instead. Just follow the recipe and cook pineapple puree with sugar and water as mentioned above for around 5 minutes. 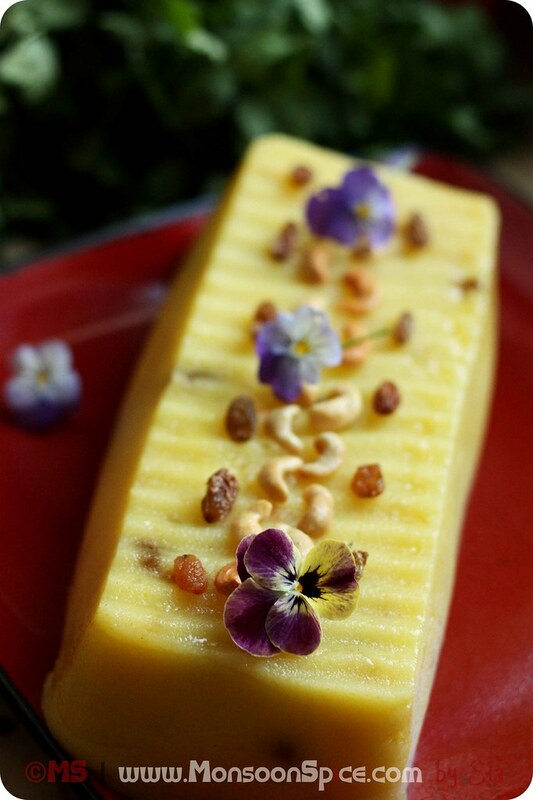 My mother usually skips cardamom when making this Pineapple Kesari Bhath as the flavour and aroma of cardamom doesn’t over power the flavour of saffron and pineapple. If you want to use cardamom, just go ahead and powder 5-6 green cardamoms. 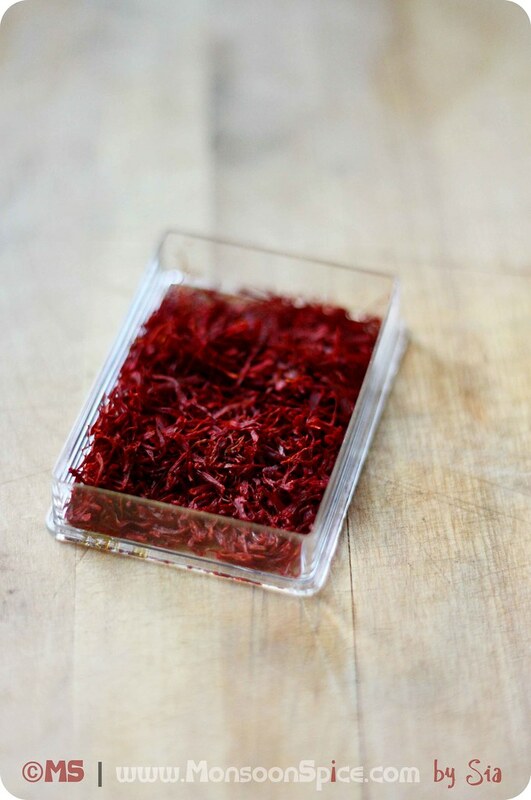 But remember to add it just in the end as the flavour and aroma doesn’t get lost in the cooking process. Be generous with the ghee or else you will end up with crumbly Pineapple Kesari Bhath. You can reduce the amount of sugar if the pineapple is too sweet. Happy Diwali to all of u! I love Pineapple sheera/ kesari. I made this for my son's first birthday party and the kids loved it! Your's looks so , so good. I just want to scoop a forkful ( followed by several others) and relish it! What a delicious dessert item! I love pineapple and semolina. 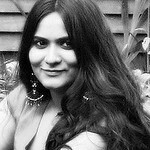 happy Diwali To you Sia......have a safe and very lightful Diwali. and the pics are very good. Happy Deepavali to you Sia. Diwali Greetings to you too!! How delicious Sia... can't get better than this!! 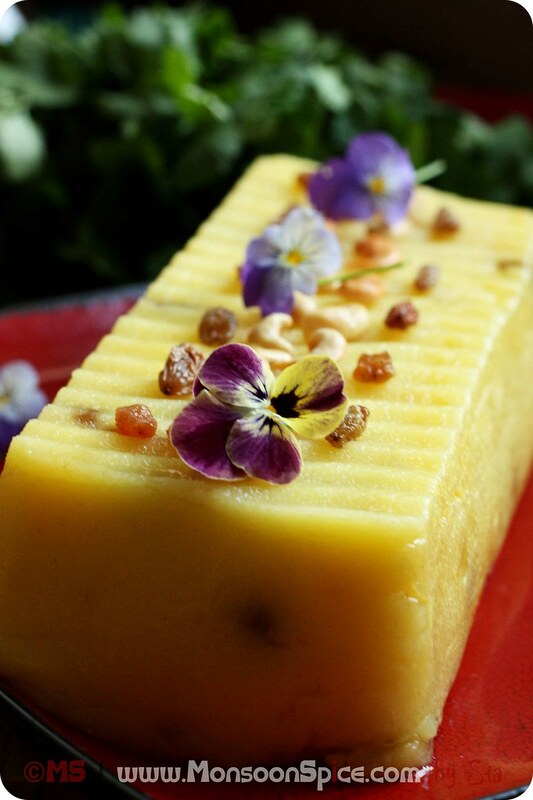 Kesari bhath is one of my favorite desserts and you've made it look even more delicious than usual. Beautiful pictures, Sia! Your website is about to expire unless you renew it, just thoght I would let you know!